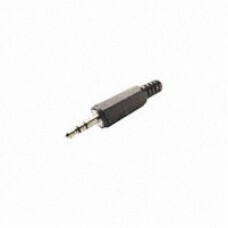 High quality, 3.5mm stereo (3-conductor) plug. Has a black plastic sleeve with flexible cable strain relief. These are the small (1/8") diameter plugs commonly used for audio connections as well as paddle inputs to many modern rigs and keyers. The PicoKeyer-Plus and MasterKeyer also use this plug for paddle input, and it can be used for input(s) to a more recent UKA-2 or UKA-3+.